Grandma said it, Mom said it, now scientists are saying it as well: Breakfast is the most important meal of the day. While a good breakfast is important for adults to perform well, it’s even more vital for children to eat a good breakfast because their bodies are still actively growing. Adults frequently indulge in a midnight snack while young children are often in bed by 9 p.m. If lunch is their first real meal of the day, they will have gone 15 or more hours without food. After the long night’s fast, a child’s brain needs to be fed in order to perform well. Numerous studies confirm that children learn more, perform better, and are less disruptive in class when their brains are well fed. Sugar often gets a bad rap. In actuality, our bodies turn any of the forms of sugar we eat – white, brown, raw, maple syrup, honey, malt, etc. – into glucose, which happens to be the main fuel for the human brain. In fact, some in-the-know teachers have taken to giving out a piece of candy at the beginning of morning classes. They report a dramatic difference in student performance. This is not to say parents should be feeding their children candy or sugary cereals for breakfast. 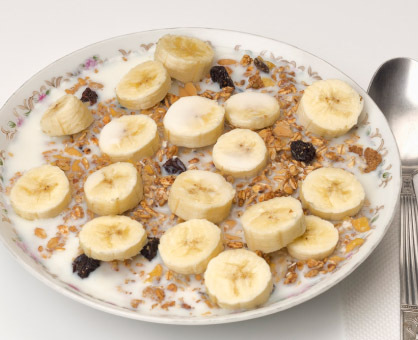 Rather, it is advocating that a balanced breakfast including some glucose-rich foods be served every morning. The healthiest source of glucose-rich food is fresh or dried organic fruit. > Add dried fruit to any hot cereal. > Pour fresh fruit sauce over whole-grain pancakes or waffles. > Add fresh or dried fruits to plain, sugar-free yogurt. Or better yet, make a breakfast parfait with layers of yogurt, granola and fruit. > Slice a banana into a bowl of organic whole-grain cereal. Nowadays, with breakfast time in most families being a tad hectic, a traditional sit-down meal may be out of the question. > Look for 100 percent organic whole grains and low or no added sugars. This rule applies to cereals, breads and pastas. Many ingredient panels often list “wheat flour” as the first ingredient. This, however, does not mean that it is whole wheat, but rather plain white flour. Using the words “wheat flour” only sets it apart from rye or barley flours. > Make sure you purchase only 100 percent real fruit juice. Avoid any product containing apple, pear, or grape juice concentrate. Although they sound healthy, they are nothing more than syrup. > Seek less processed breakfast meats. For example, there is little protein in bacon. As a substitute, look for low-sodium sausage or ham. > Experiment with alternative sausage made with either soy or turkey. Again, choose products with less sugar and sodium.